...than a giant snake behind. Hopefully, they didn't leave it behind in the toilet. why don't they know if it is a python or a boa? Couldn't they tell from the feathers? How do you separate a man from his snake? With a crowbar...! The guy's lease probably said he wouldn't be allowed to have a dog over 25 pounds, so naturally a 7-foot python is the next choice. I believe the writer of this article must have been a fan of sir mix a lot. I believe the only difference between a python and a boa is tha fFemale pythons lay eggs . . . something like this post. The landlord must be a male, otherwise there would have been no complaints about the giant snake behind. LOL, tnx! Some stuff u can find on Entertaiment in Azerbaijan. "Hey, I HAD to leave. The snake wasn't paying his half of the rent." Well, I'm here but not happy about it. I had something cute to post on SOK and now it's not relevant. El, stop your teasing. Post it, dammit! Don't make me break your hummer. Cool, I like it Coast. Sounds like a Godzilla movie. Would I regret it if I suggested Snakes In Kilts (SIK)? I am here. You may now commence the humour portion of the program. Good remembering, Blue. My goal for the day is to remember my personal info and my location at all times. Its okay KDF - I'll remember it for you. ;) Thank you ASK. As I said, it's a goal I've set for mySelf. Private message to KDF - everyone else just move along, please. KDF, I'm feeling like an idiot and stupid - AGAIN. And this time you won't disagree with me since I know you've already thought it. Check your e-mail in about 5-10 minutes. If I agree, can I have an e-mail too? Those are stretch goals for the likes of us, KDF. Can I have an emale too? Boy, El takes her dental hygiene very seriously. I mean, 24 minutes? Hold, please. My grits are ready. And I'll have you all know that El is still brushing her teeth. So, I don't got neither. *whispers* why yes, yes you are CR. It hasn't escaped my notice, I just haven't seen a casual and subtle moment in which to jump you. I would suggest ducking soon. ↓ is apparently suffering from an excess of moisture. She was planning on skipping, not slipping. I have drooling issues. I know. Someone hand me my bib. That looks sooo much worse looking than I intended and yet I will be posting it anyway. Okay, El must have meant dog-minutes. Yeah, Wolfie, I'se gonna say...although slippery kinda makes sense on a snake thread. Must... put... blig... away. Later, Lil' SOKs. Wait.. I don't drool. I swallow. Umm.. that is sooo not helping any. It's raining and I forgot my umbrella. So I'm wet. Okay? No not okay. I forgot to towel off after my shower. Yeah. That's better. I think. Is it suddenly warm in here? ...silence...sound of toilet flushing...running water.. I soooo totally meant to do that. Hey - stop! - that was the last of the tp! So we're slipping and sliding this morning, eh? I think someone spilled the jello last night and didn't clean up. but El - looks like you're e-mailing everyone but me - what's wrong with me? is it my breathe? are you intimidated by my stunning good looks? do i got a booger on my face or somethin'? :( don't take it personal Thaddeus, I didn't get an e-mail from El either. Don't say that just to try to make Toto feel better - sheesh! AAAAAGGGGGGGHHHHHHH! I've had four error messages in a row accusing me of...of being...comment spam! I'd say something about wolfies eating bunnies (especially scruffy yet stunningly good looking ones), but I think I might have used up my innuendo quota for the day already. I know you will use this better than I possibly could. hey, that was me! what happened to my name? I can't figure out how to post annonymously and sg does it on accident. I've wondered how to post anonymously...but haven't tried it yet. S-G, maybe Deon took it? Can someone show me how, please? Blue, Deon knows everything else, so maybe he does know what happened to my name! Didn't you switch to Betty Boop not too long ago, S-G/BB? Careful what you put upper-inuendo there Blue. Sorry, Coast, I can't reply the way I would normally. There is now an innuendo filter activated against my Blog account, and I have to resort to direct and explicit language. Hello neighbors! Who wants cupcakes?! You don't like the cupcakes? I know they're kinda small, but you can have more than one. 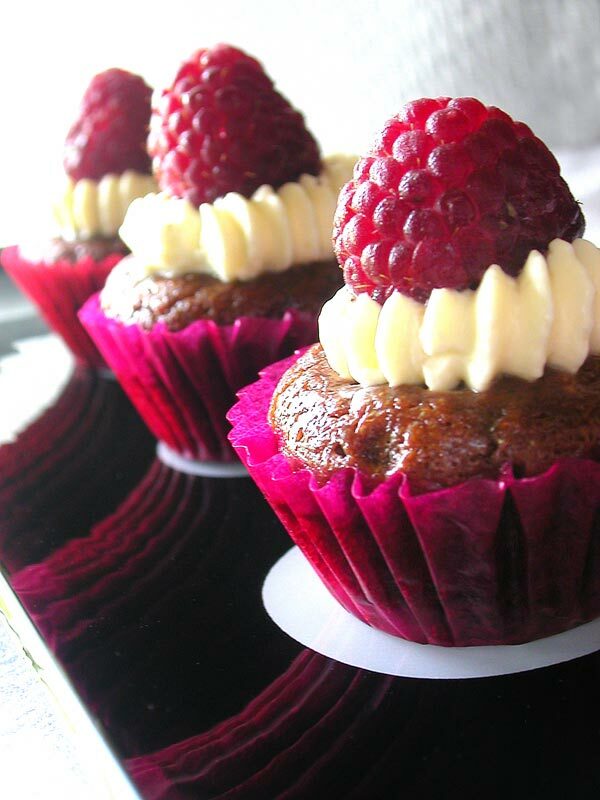 And they have raspberries on top! Yum! Chocolate and raspberries. It's the innuendo filter operating on my comments, Sarah. I was offering a very nice compliment on your UNACCEPTABLEs, but apparently anything having to do with UNACCEPTABLEing is being blocked. All I did was bake mini cupcakes and put fruit on top! Agh! It is not expired. It's a brand new one, just got it yesterday. The old one was gold, but I wanted a silver one. It goes better with my hair. Um, you can't even wear it without activating, so obviously I called as soon as I got it last night. Blue just thinks I said something or did something on purpose that I didn't. I don't even know what it is he thinks I said/did!! Anything worth saying is worth repeating. Yeah, ASK. That's the whole problem. Nobody can possibly be that naive. But its fun watching her try. Not referring to the repeat.